PlatinumGames posted a video featuring a prototype version of Bayonetta. The version is dated 7th November 2007, nearly two years before the game’s release in Japan. 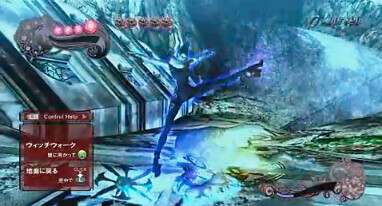 Notable differences to the final version include Bayonetta’s look, here portrayed much younger and with a black and white outfit, as well as a bar that appears to serve as a countdown for her signature power Witch Time. Other differences include the pick up button, here assigned to B (or Circle) instead of X (or Square), the user interface being completely different and a motorcycle serving as means to attack enemies whilst in a regular area as opposed to the dedicated level seen in the retail game. Also worth mentioning is the fact some of the areas seen in this development version appear to be absent from the final game. While many of Bayonetta’s moves appear to be slightly different, it is noticeable that most of them were already implemented in the game two years prior to its release. Hit the jump to watch the videos. This entry was posted on November 18, 2010 at 8:48 pm and is filed under Bayonetta, PlatinumGames, PlayStation 3, Xbox 360. You can follow any responses to this entry through the RSS 2.0 feed. You can leave a response, or trackback from your own site.